Beginning January 1st, 2019 (or the first show after the previous 2018 State Championships), all Cinch RSNC contestants will have the opportunity to compete in a State Championship at the end of the Cinch RSNC season for that state. Producers from your state, starting with the producer that submitted the most sanctioned teams, will be offered the opportunity to host a State Championship Finals. Numbers of teams are determined from World Finals to World Finals and the previous State Championship shows do not count towards team count. This gives producers ample time to prepare for the event. 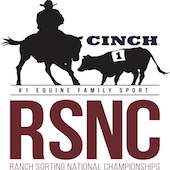 If a producer accepts the State Championship event, Cinch RSNC will help furnish awards. For every state that sanctions at least 5 Cinch RSNC shows in 2019, Cinch RSNC will contribute up to 7 Trophy State Championship awards. For every state that sanctions 10 or more shows Cinch RSNC will contribute prizes through 5th place in each of the 7 rating categories. The points system through the year will be identical to the current Cinch RSNC National Finals point’s race. First place contestants will earn ½ point for 3-4 teams, 1 point for 5-9 teams, 2 points for 10-14 teams, 3 points for 15-19 teams, 4 for 20-24, 5 for 25-29, 6 for 30-34, 7 for 35-39, 8 for 40-44, 9 for 45 and over up to 100 teams. If more than 100 teams in a class then the points will be doubled. These accumulated points will determine the contestant’s placing in the Top 20 of each division for their state. Only top 20 contestants that have competed in a minimum of 4 shows prior to the State Finals in that state’s point race are eligible for prizes and the winners will be determined by total points won throughout the year and at the State Finals for each of the following categories: Beginner, Rookie, Novice, Amateur, Open, Masters and Youth. All Cinch RSNC Regionals, State & County Fairs, plus the following events (Congress Super Sort and Cheyenne Frontier Days) will be awarded double points and participation credit. In addition, all shows with 1,000 teams or more will be awarded double points and participation credit for show count to attend State or World Finals. Additionally, if a state or county fair is scheduled as a 2, or more, day event, it will not count more than double participation. Each First-Place winning member from each rating category from each state will permanently be listed in the Cinch RSNC HALL OF FAME! The state high money winner and the high money horse from each state will additionally be enshrined into the Cinch RSNC HALL OF FAME! Contestants must attend at least 4 shows prior to the State Finals in the state in which they wish to compete and also ride a minimum of 5 rides at that State Finals event to qualify in the points race for that state and for that state’s State Finals prizes. For an event to count as a qualifying show for the 2019 State Finals, contestants must enter a minimum of 5 times in each show. If a contestant qualifies in more than one state they have a chance to compete in more than one State Finals event. If a contestant qualifies in 2 divisions, they have the chance to win a prize in both of the divisions. In the event that there is a tie on points for the State Finals prizes there will be a Tie Breaker Rule: Total # of cattle sorted in all classes at the finals that points were applied to will be the 1st tie breaker. If this does not solve the tie then we will go to the shortest amount of time it took to sort that amount of cattle. Good Luck to all!